Earn $2.78 in Rewards credit (278 points) What's This? 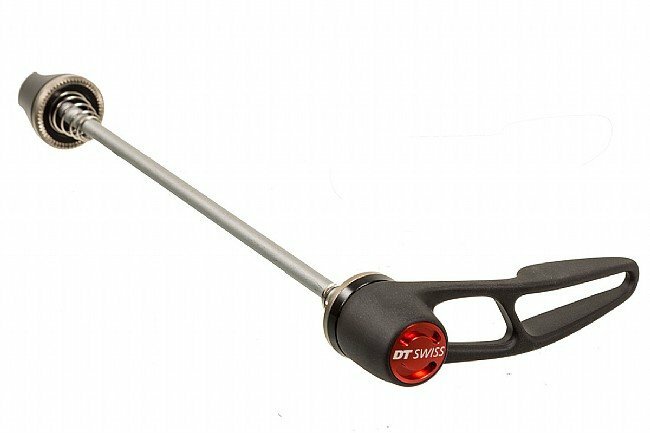 The DT Swiss RWS MTB Skewer provides maximum adjustability for the perfect tension and lever positioning. 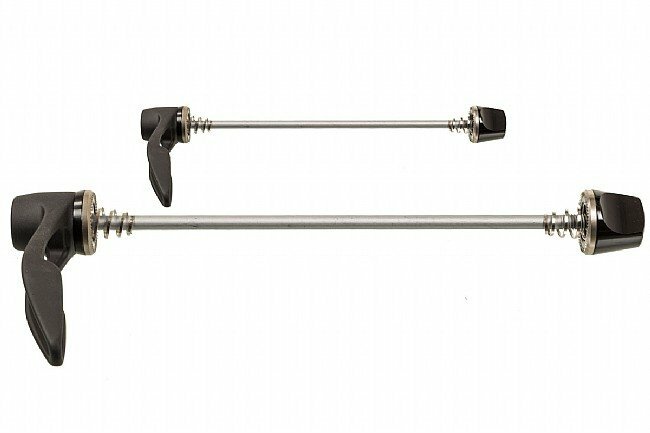 Instead of the normal cam operation found on quick-release skewers, the RWS system uses a one piece alloy lever that turns with a ratchet system to increase tension on the skewer. This allows for a strong connection that can be finely tuned. 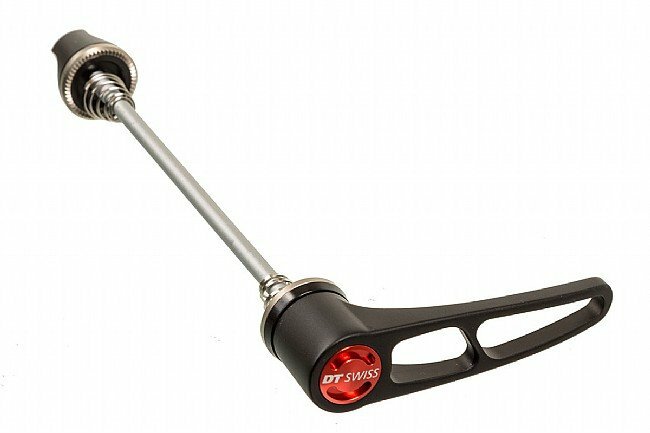 5 mm steel axle. Sold per skewer. Claimed weight is 50 g / front and 54 g / rear. I bought these for my Ridley CX bike. The skewers that came with my original wheelset, and the race wheels I use, constantly had the skewers loosening up during a training ride, or worse, during a race. 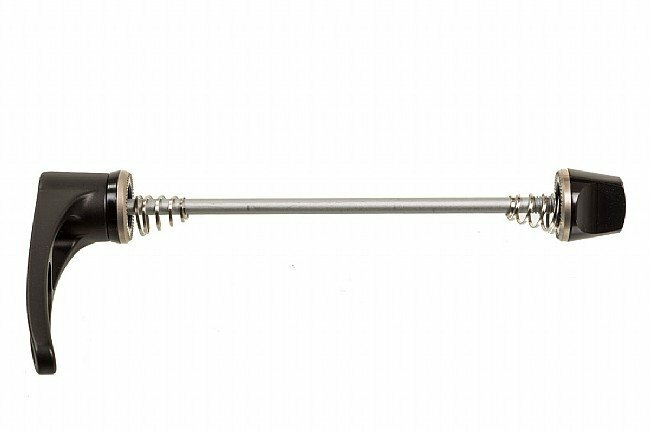 These skewers allow you to keep tightening the skewer until you are happy with its force, and then you can simply push in the end and rotate the lever out of the way. Stays tight! Skewers are a small thing we don't really pay attention to them until we have to take our wheels off. These skewers are a step up from the old-style clamp downs. There's no more fiddling around or guessing if the skewer will close too tight. After rotating the handle to tighten the connection, you can adjusttuck the lever handle in any position by simply raising it and positioning it in the desired spot. It's practically fool-proof. There is a slight difference between the MTB and Road QR handles. The former has a flatter handle whereas the latter has a curved handle. It looks cosmetic, but it may be important if you've got largewide forks and clearance is important. When in doubt, the MTB skewer will provide the most room (it's raised away from the forks). 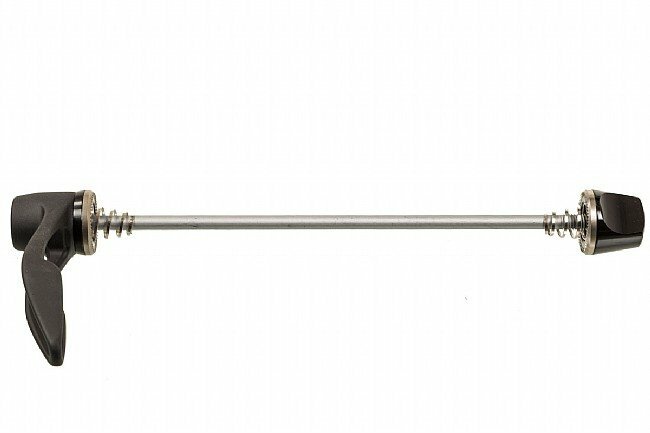 Best Skewer if you really need to crank things down! New Improved Design! I've used these DT Swiss skewers on many different Mountain Bikes but where it really shines is using it on a Trek Carbon SuperFly Single Speed. The bike was converted (Temporarily!) from SS to 10-speed. Keeping the rear wheel in place using a standard skewer was impossible. With the Crank Down design of the DT Swiss you can really squeeze the wheel into place. Not to mention the aggressive biting teeth where the skewer ends bite into the drop out surface. I've also been really impressed by the new internal gear design. You can really feel the engagement versus their older models. They are more expensive than a standard skewer but...This is a very well engineered design and they look good too. My son's bike (Trek Roscoe 20) came with weird skewers that need a 5mm hex wrench to remove so I got a pair of these for him and they're great. Holds the wheels securely and being able to reposition the handle is awesome. He's got a goofy boost qr rear hub so I went with the 150mm tandem version for the rear. I have these on my cx bike too and my fat bike has the Bontrager labeled thru axle version. I'll probably order a few sets of these as stocking stuffers. They're especially great for those people in our lives that crank down a normal qr skewer without using the cam. Only downside I can think of is that other colors aren't offered. I have a DT Swiss through axle on my DH bike and wanted the 1355 version for my 29er hardtail, since I like the ease of use and re-positioning of the DT Swiss system very much. This skewer is well worth its money and provides a very secure mount of the wheel. The ratchet re-positioning is perfect to get it right every time! Next best thing to a through axel. Really , really, secure. Great product and price. The skewers are cheap and lightweight, while at the same time they are very attractive and hold VERY tight. Bonus points that I can re-position the lever after tightening. After buying these I can't imagine using anything else.